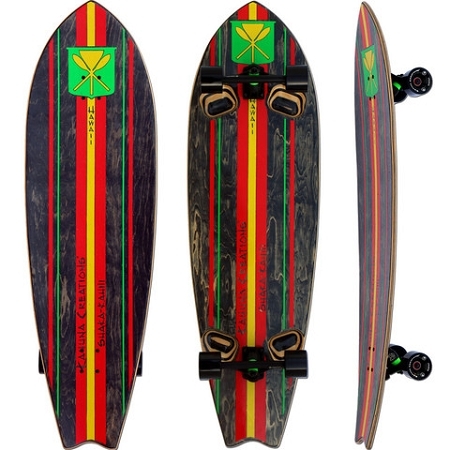 The new Shaka Kahili Longboard brings the ultimate feel of riding on water. With a premium surfboard rocker shape (tip and tail curve up), it won’t leave you skidding out of control after dishing out a sweet turn; you’ll have a lower center of gravity backed up with a wide, totally secure body, where you can truly feel the ride under your feet. Complete control and unique leverage gives nothing but smooth, buttery turns. The Shaka is perfectly designed for land paddling with a Kahuna Stick. This is a ride that can only be described as ‘freedom’. The Shaka Kahili Longboard pays an important tribute to its Hawaiian roots. Kahuna Creations proudly raises the Kanaka Maoli original Hawaiian flag in its artwork. Unlike the present Hawaiian flag with Western colonial symbols, we respect the original flag of the Kingdom of Hawaii; traditional red, yellow and green Hawaiian Kahili coat of arms and two crossing paddles that speak to the heart of any board rider that knows where they came from. Featuring Kahuna Creations’ signature Tahitian lava sand grip, the new family of Shaka longboards are the crown jewels of Kahuna board riding. From a ride that you have to feel to understand, down to the pride and joy of the Aloha Spirit, the Shaka Surf Longboard is destined to ignite the soul and free the spirit.